Round Six of the 2019 Club Championship was played on Friday, March 29th with 16 players. The table shows a new leader as Mick Dyett's win and Brian Ramsey's 4th placing jumped Mick from 3rd to top , relegating Brian to second just ahead of Gerhardt Macor. The results also jammed up the following players with only 7 points separating the top 8. Winners of round 6 were Mick Dyett, Tony Walker, Alan Cathcart (again!!!!) and Dave Bower (ditto repeato!!!). The Championship Ladder can be viewed via this link . Regular Newcastle Open player and former member Paul Barnett took out the first Sydney Open played on Sunday April 7th. Monthly tournaments began on Sunday, 10/2/2019, at the Persian Rose Restaurant, Turramurra. Next to be played April 14th. Registration from 9:30 for a 10 am start. Entry $50 with an optional $50 side pool, Round Robin play. Chouette and Jackpot tournaments run to demand for players knocked out of the main. These tournaments will be held on the second Sunday of each month from February to October. 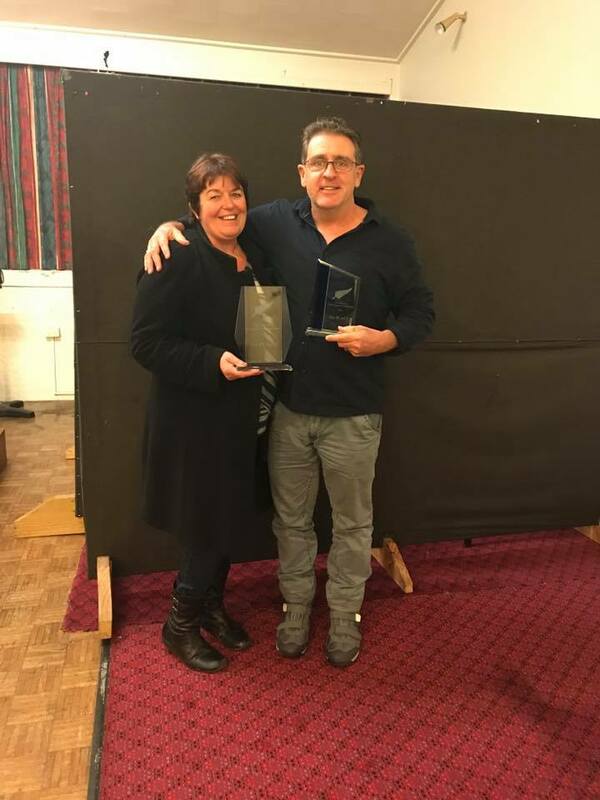 The Presentation Night for 2018 was held at Charlestown Bowling Club on Friday, December 7th. 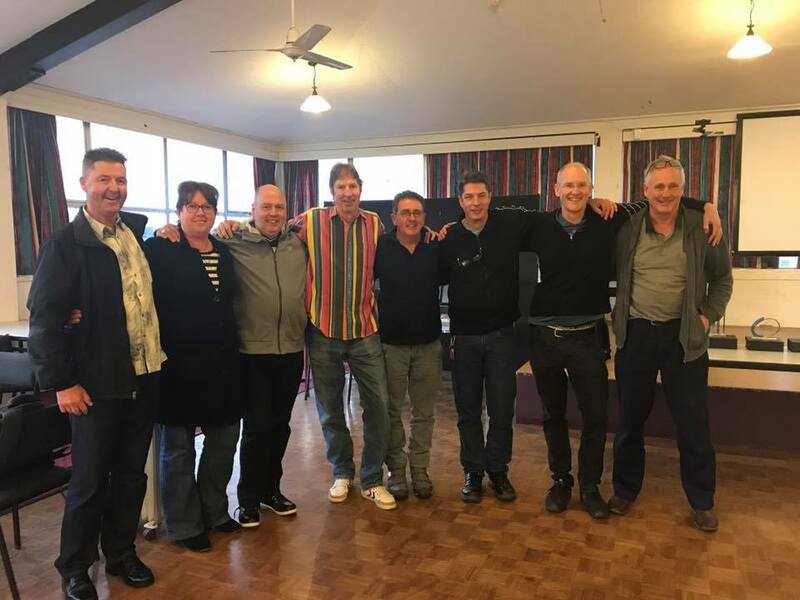 Barefoot bowls on the Charlestown club's synthetic green was followed by the meal, the AGM for 2019 (having been moved forward from early in the new year) and the Presentations for the 2018 Club Championship and Finals. The minutes of the Newcastle Backgammon Club's AGM for 2019 can be found on the AGM page here. Brian Ramsey won the 2018 Willy Backes Memorial Top 8 Trophy at the last competition night of 2018, November 30th. Brian defeated Greg Mitchell, 9-2 in the final after beating Adrian Marisescu (7/1) and Robert Disney (7/6) in the first two rounds of knockout. Greg made the final via wins over Dave Bower (7/3) and Mick Dyett (7/1). The 2018 President's Trophy was held on Friday, November 23rd. Unfortunately not all those who qualified were available on the night so the second division was reduced to six players. Dave Bower is the President's Trophy winner, defeating Michelle Taubman 7-6. None of the top 4 qualifiers made it past the first round as Robert Disney beat Adrian Marisescu, Bruce Parr got past Gerhardt Macor, Mick Dyett went down to Michelle Taubman and Dave Bower was too good for Robert Sebok. Dave won 7-1 over Robert and Michelle defeated Bruce 7-6. In the second division, Costea Ianculescu got a late call-up and made it all the way to the final before losing 7-4 to Tony Walker. Tony defeated Mel Dyett and Les Pierpoint on the way to the final whilst Costea got by Cassie Crebert and Alan Cathcart. Round 20 of the 2018 Newcastle Backgammon Club Championship was held on November 2nd with 16 players. Welcome back to Costea Ianculescu and Alan Cathcart. MIck Dyett's had wrapped up the 2018 Club Championship after winning his Round 19 heat and, in the process, completing a treble of Club Championships. Adrian Marisescu maintained second spot 8 points behind and Gerhardt Macor nosed out Dave Bower and Greg Mitchell for third. Winners of Round 20 were Gerhardt Macor, Greg Mitchell, Alan Cathcart and Costea Ianculescu.. The full table is available via this link. Ian Dunstan defeated Newcastle's Gerhardt Macor in the Final of the 2018 Australian Open held on the 3rd and 4th of November. Newcastle provided two of the last 8 players as Mick Dyett also qualified but Gerhardt and Mick were drawn in the same half of the draw and played a semi-final. The other semi-finalist was Jan Spillikom. The 2018 Master's (18 players) was taken out by Peter Brown from Simon Woodhead. Habib Shalala and Steve Roberts were the semi-finalists. Both Gerhardt and Mick played in the Master's but lost their first matches. Martin Sagradian is the 2018 Newcastle Open winner, played in the Patricia Room at Charlestown Bowling Club on Sunday, September 16th. The result of the Special General Meeting, to discuss the letter received from the Australian Backgammon Federation (posted lower on this page) is available on the AGM page via this link. The results for the 2018 Captain's Trophy Finals, played on June 29th, 2018, are below. Congratulations to Brian Ramsey who defeated Robert Disney in the First division Final and Shaun Harding, 7/4 victor over Alan Cathcart in the second division. 2018 CAPTAIN'S TROPHY 2ND DIV. The 2018 NSW Open was conducted at North Ryde RSL in Sydney on Sunday July 15th with 33 players in a Swiss Tournament. The sole survivor, winning all 5 matches, was Martin Sagradian with Peter Brown runner up, George Avramides 3rd and John Symon, who lead the rankings for the first 4 rounds, finishing 4th after losing to Martin in the last round. Newcastle players Mick Dyett, Robert Disney, Tony Walker, Michelle Taubman and Gerhardt Macor were all out of contention for the top spot after the 3rd round. I am writing today as it is close to the time when we would like current member clubs to renew their affiliation with the Federation by forwarding the $25 membership fee. Bank details: Australian Backgammon Federation, BSB 082048, Acc. No. 839626033.Please utilise the form under the membership heading on the ABF website and forward to John Symon at johnsymon2191@gmail.com when you have deposited your membership dues and a receipt will be issued. We are acutely aware that there has not been much advantage in being affiliated (apart from a feeling of solidarity) but we are aiming to offer more in the future such as trophies, financial assistance with venues, advertising expenses etc. This letter is therefore going to all clubs whether affiliated or not in the hope that all clubs will join. The Board has agreed to provide some financial assistance for approved tournaments, with preference for the smaller clubs to benefit. Please consider what we can do to assist you in any way. We are open to and would appreciate suggestions. We are also planning to establish a ranking system for members. Therefore I urge you to encourage your members to join the Federation for a small $10 membership fee. Anyone playing in the upcoming 2018 NSW OPEN CHAMPIONSHIPS will receive automatic membership. The results of the AGM held February 2nd are on the AGM page. The 2018 New Zealand Backgammon Championship was held at the Taksim Turkish Bar and Restaurant, Auckland on April 7th and 8th. There were no Newcastle entries this year but a couple of Australian names appear in the full results although it seems it wasn't a great tournament for them. The 2018 Doubles Tournament at the Persian Rose Restaurant was conducted on February 18th, 2018. The Doubles Tournament was a huge success with every player keen for a repeat. A big thank you goes to the Tournament Director, Taeed Athari, who was instrumental in making this tournament a reality. 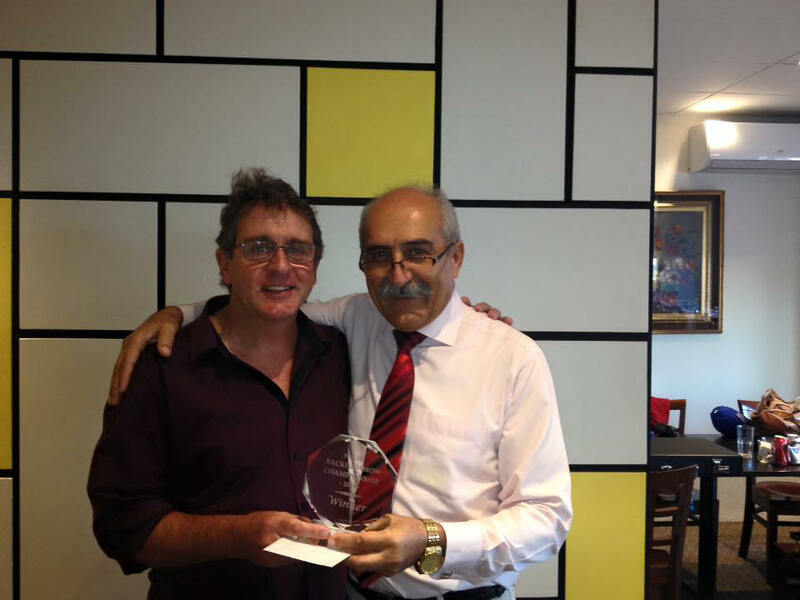 Taeed put together a great tournament and he kindly provided the venue (the Persian Rose Restaurant). Taeed and I would like to thank Zvi Bendavid for donating the trophies. 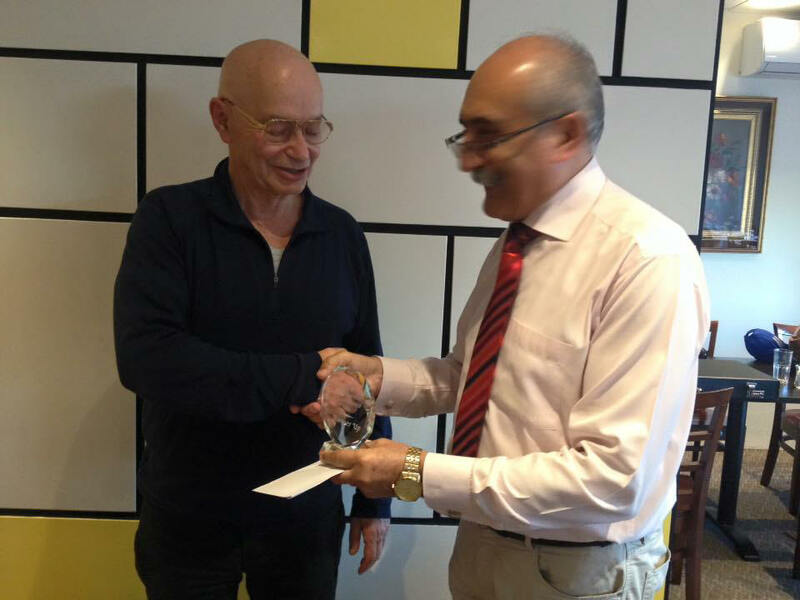 Zvi has supported many backgammon tournaments by donating the trophies. This enables all entry fees to be returned as prize money. A big thank you goes to Sharne Dyett who worked tirelessly on the front line making sure everything ran smoothly. Not only did she handle the administration side of things with great expertise, but when a player was short of a partner, she volunteered to enter the tournament to ensure a 16 team event. 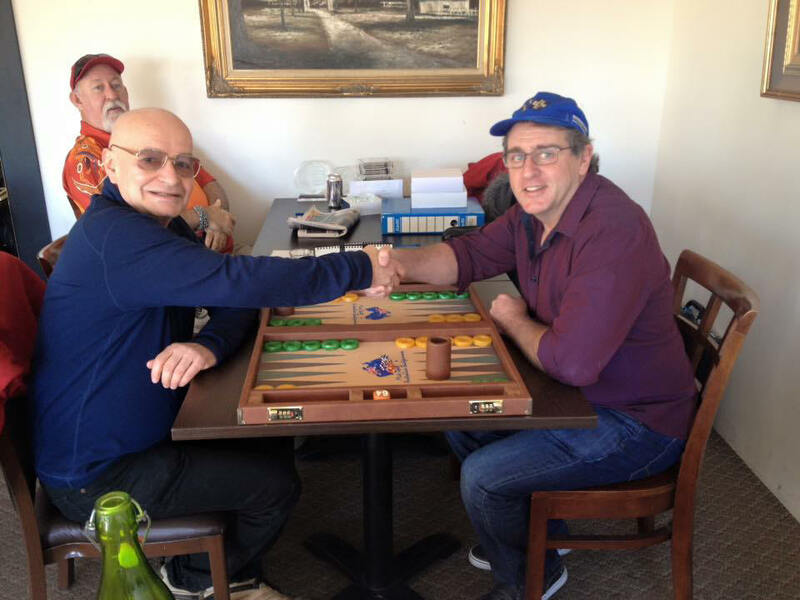 Having never played in a backgammon tournament before, Sharne rose to the occasion by teaming up with Hussein Haydari. I would like to thank all the players who attended for supporting such a fun event, especially those who travelled long distances, Grant Hoffman from New Zealand, Simon Uey from Victoria and Hussein Haydari from Canberra. It was always going to be very tough to win this Tournament. There were some very tough players attending. The first two rounds were nine point matches while the Semi-Finals and Final were 11 point matches. After two rounds we were at the Semi Finals. In the first Semi-Final; Gerhardt Macor and Lorenzo Caita-Mandra played Arthur Ramer and Julian Marroquin, while Richard Crawley-Boevey and Martin Sagradian versed Robbie Solomon and Ian Dunstan. Gerhardt and Lorenzo made it through as did Robbie and Ian. 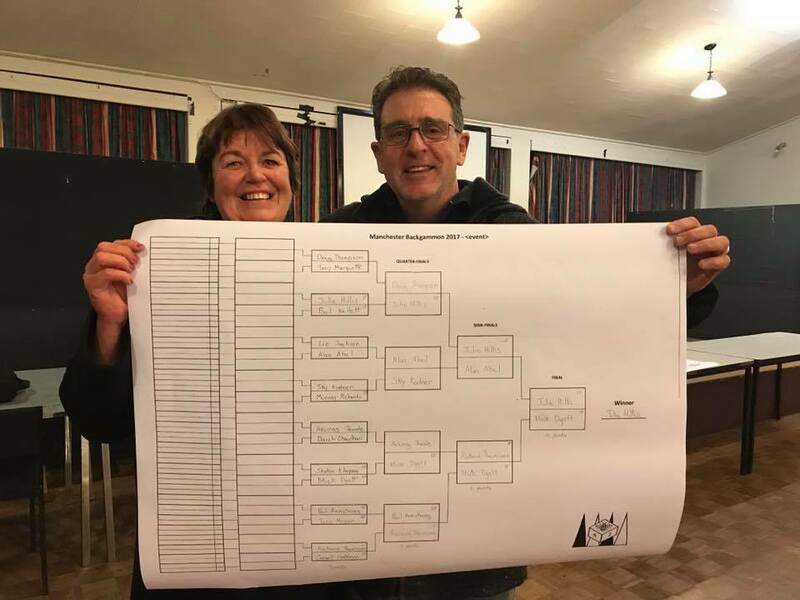 As fate would have it, Gerhardt and Ian played in the finals of the 2017 Australian Backgammon Championships, with Ian winning the title. That they met again in the finals of a tough doubles tournament is no accident, they are both very strong players. This time though they both have help. Robbie Solomon, one of the strongest players in Australia and Lorenzo, who may not have as much experience as Robbie, but is just as determined to win the tournament. The match is a tight one, until Ian and Robbie take the advantage 10-6 Crawford. Gerhardt and Lorenzo win Crawford (making the score 10-7), and then Gerhardt gives an automatic double in the next game. Gerhardt plays for a blitz and it succeeds. Match and Championship win to Gerhardt and Lorenzo. Congratulations to both teams for getting to the finals and putting on a great show, not just in the finals but on the road to getting there. The thing which is so interesting about a consulting Doubles Tournament is being able to hear the thought process of the players as they plan their moves and cube strategies. We had a $50 knockout with eight players involved. The Final was played between Alex Falon and Simon Uey with Simon taking the win. Congratulations to both. This Doubles Format proved to be very popular, and it is no surprise that players were making inquiries about organising another one, and we will. After all…we love the game. The 2017 Presentation night was held at Charlestown Bowling Club on Friday December 8th. A barefoot bowls session was followed by a BBQ dinner. Mick Dyett and Brian Ramsey collected the majority of the spoils with Mick winning the 2017 Club Championship and the Willy Backes Memorial Top 8 Trophy and Brian winning both the Captain's and President's Trophies as well as runner up in the Club Championship. Gerhardt Macor took 3rd in the CC and Alan Cathcart and Costea Ianculescu won the Captain's and President's second divisions respectively. Some photos of the night are available on the Presentation night page. Round 20 of the 2017 Club Championship was played on November 10th with 14 players in four groups at Charlestown Bowling Club. Mick Dyett ran down long time leader Brian Ramsey to defend the Newcastle Club Championship by 1 point after the final round. With both players in the same part of the draw it was up to who could finish highest in the group as to who would win and Mick's win over Brian in the middle match of the round robin was enough to see him over the line. Gerhardt Macor finished third by winning the top 4 clash and Adrian Marisescu placed fourth by winning his RR. The tables page is here. Brian Ramsey won his third President's Trophy in a row on November 24th by beating Robert Disney in the Final 9-2. Brian defeated Alan Cathcart and Adrian Marisescu in the first 2 rounds whilst Robert beat Bruce Parr and Mick Dyett. Costea Ianculescu had to survive an extra round on his way to winning the President's second division, defeating Michelle Taubman 7-5 in the Final. Costea and Ian Dews had to play a round 1 match as only 5 players contended. Costea then beat Robert Sebok in the semi and Michelle outlasted Dave Bower 7-6. A reminder that the Top 8 Trophy on December 1st. The draw grid is below. As noted above Presentation night is December 8th. Players are reminded that should there be any dispute during the playing of a match to please ask for a ruling at the time. We have enough experienced players capable of giving a verdict on any problem that may arise during a match. Copies of the rules are always in the box for perusal at any time. Newcastle's Gerhardt Macor fell just short of winning the 2017 Australian Open held at the Persian Rose restaurant in Turramurra on the weekend of 11/12 November. In what was a double elimination tournament (meaning players had to be defeated twice to be knocked out) Gerhardt won the winner's bracket meaning he only had to win once in the finals series to win the tournament. Sydney's Ian Dunstan won through to the final through the loser's bracket (being the only player to have lost only 1 match during the tournament) and went on to defeat Gerhardt in the last 2 matches. Congratulations to Ben Phillips on winning the 2017 Newcastle Open from Robert Disney 9-8 on Sunday at Charlestown Bowling Club. Semi-Finalists were Mehmet Tuglu and Jan Spillekom. 25 final entries, from Newcastle, Sydney, Canberra and the Gold Coast, competed in 7 round robins to decide the make up of the field for the knock out Bracket with all round robin winners qualifying. The Final field makeup was drawn from the hat hence "position 2" being the bye. Ben was down 3-8 but just kept surviving and hitting the "last chance" blots that were forced to be left to take out the title. The Consolation Tournament, open to all those that didn't qualify for the main was won by Martin Sagradian from Sydney over Newcastle's Adrian Marisescu. Thanks to all that attended especially those who travelled distance to come. Special thanks to Charlestown Bowling Club and First Creek wines (via Bruce Parr) for their contributions to the day. Also to Michelle Taubman for her assistance on the day. 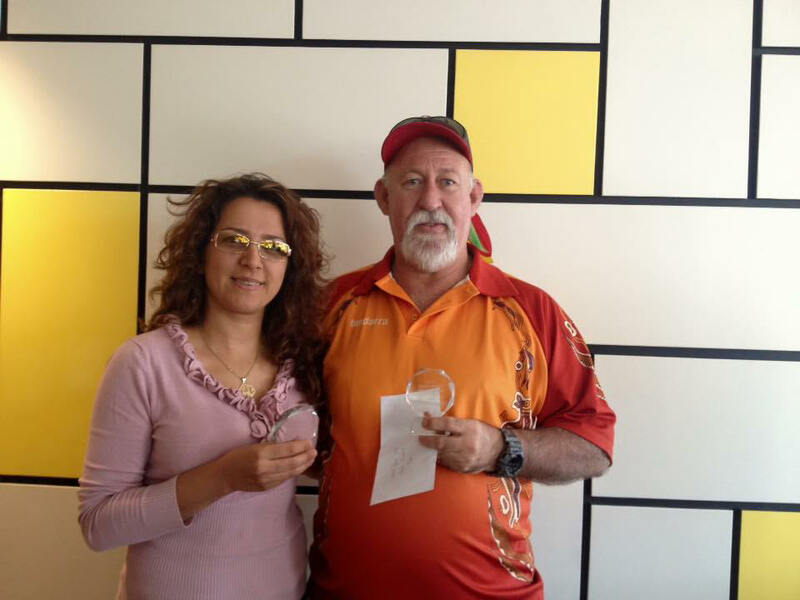 Mick Dyett has finished second in the New Zealand Open completed July 23rd, to local player Julie Hillis. Pictures below courtesy of Sharne Roxby via Facebook. For full details on the result of the Extraordinary General Meetings of the Newcastle Backgammon Club (19/5/17 adjourned to 2/6/17) please see the AGM page. The 2016 Club Presentation Night was held on December 2nd at Charlestown Bowling Club, the current "home" of the Newcastle Backgammon Club. The night began with a number of members taking part in a few heads of barefoot bowls on the CBC's synthetic green. Most had not played bowls before and whilst styles varied from the "norm" a good time was had by all. The dinner was held in a section of the Function room which was all too large for our modest group but greatly appreciated. Thanks to Charlestown Bowling Club for hosting all our competition this year and to all members for their continued support of the Newcastle Backgammon Club. To all players and members of the NBC Facebook pages, Merry Christmas and a Happy and Prosperous 2017 ! Bruce Parr won his second consecutive Top 8 Trophy by beating Brian Ramsey 9-0 in this year's Final on November 25th. The bracket is below. Picture shows the start of the Final, Bruce Parr (left) vs Brian Ramsey. Photo courtesy of Michelle Taubman. The results of the 2016 Willy Backes Memorial Top 8 Trophy Final are below. Grant Hoffman of New Zealand has won his second consecutive Australian Open defeating Newcastle's Gerhardt Macor 15-9 in the Final on November 13th. It is also the second year in a row that Grant has defeated a Newcastle player for the title after beating Bruce Parr for the 2015 title. The semi-finalists were Darren O'Shaughnessy and Richard Crawley-Boevey. Adrian Marisescu took out the Jackpot tournament. Congratulations to all concerned. Be advised that Wednesday night backgammon in Sydney has moved to the Woolloomooloo Bay Hotel, 2 Bourke St, Woolloomooloo as of September 27th. Contact John Hedge ( johnhedge@gmail.com ) for further details. 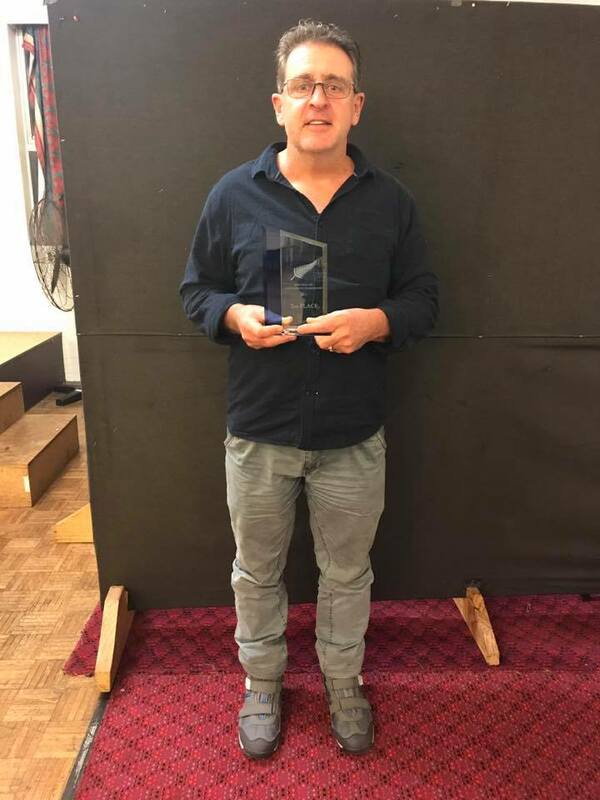 Simon Woodhead of the Gold Coast is the 2016 Newcastle Open winner which was held in the Lincoln Room at Charlestown Bowling Club on Sunday, September 18th. Photos and report on the Open Details page. 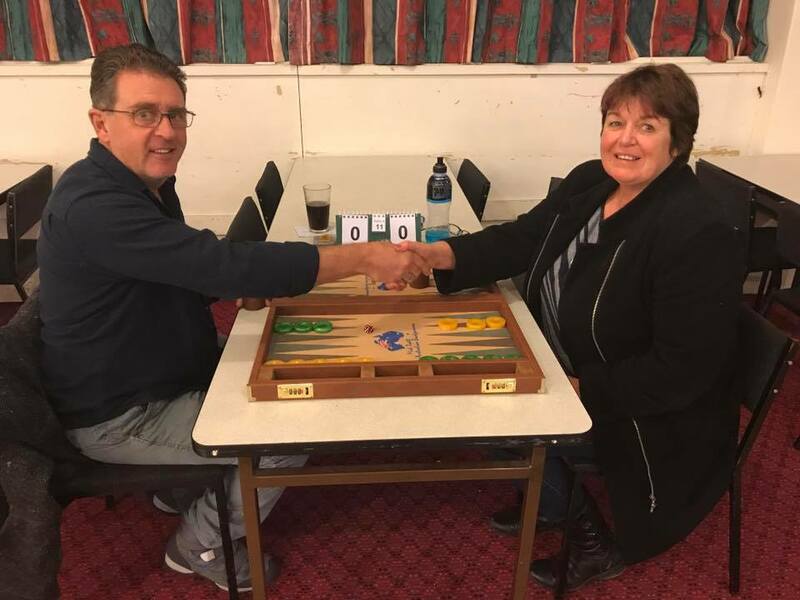 The Newcastle Backgammon Club team took out the 2016 Club Challenge from the Persian Rose Club team at the Shelly Beach Surf Club on August 28th. The two teams of six players were drawn from the hat into groups of 3 with the NBC "Team A" playing individual matches against the PRBC "Team A" and the "Team B" players doing likewise. At the lunch break 7 matches had been completed with the PRBC holding a 4-3 margin. Lunch in the Surf Club restaurant was considered by all to be value for money and can be recommended. Back in the playing room and the evenness of the competition continued. The team A side of the draw completed their matches first and with the last 3 matches of the B side all in play the PRBC led 8-7 with a score advantage in 2 of the matches. Michelle Taubman and Mick Dyett both came from behind to kick Newcastle 9-8 up leaving it to Gerhardt Macor to complete the victory and be the only player of the 12 to win all 3 of his matches on the day. With thank to John Hedge for his part in organization of the day and the Shelly Beach Surf Club for their hosting of the event. The full teams were: NBC- Mick Dyett (C), Michelle Taubman , Robert Disney , Tony Walker , Gerhardt Macor and Costea Ianculescu. PRBC- John Hedge (C) , John Symon, Martin Sagradian , Mark Catusanu, Michael Mills, and Ian Dunstan. The 2016 Captain's Trophy flights were played on June 17th, 13 players attended. The Top flight was taken out by Adrian Marisescu over Robert Disney, 7/3. Adrian defeated Tony Walker and Brian Ramsey on his way to the Final. Greg Hern outlasted Michelle Taubman 7/6 in the Second flight. The grids for both divisions are below. Mick Dyett is the 2016 NSW Open winner, defeating Arthur Ramer 17-10 in Sunday's final at the Persian Rose restaurant, Turramurra. Newcastle was assured of a finalist as Tony Walker and Mick played in the semi final. Arthur beat Shadi Athari to reach the final. Photos below, the presentations being made by Persian Rose proprietor Taeed Athari. Photos courtesy of Sharne Roxby via Facebook. Long time Newcastle Open attendee Alex Ivanovski defeated Zvi Bendavid in the final of the Persian Rose Easter Tournament. Three Newcastle players, Mick Dyett, Greg Mitchell and Gerhardt Macor made the last 8 but all were defeated in the first round of the finals. Newcastle Backgammon Club membership is $10 per year and competition fees are $5 per night. The winner of each round robin (groups of 3 or 4, depending on the number of players) receives $10. 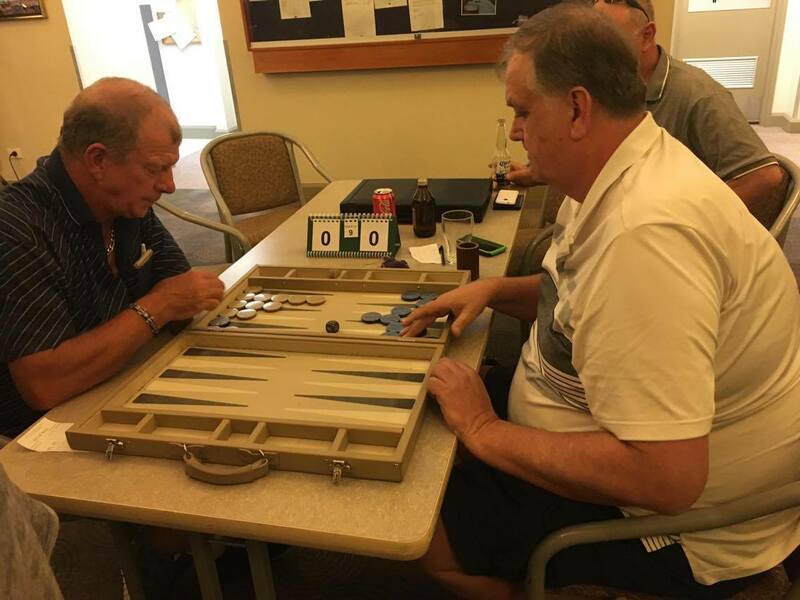 The Newcastle Backgammon Club AGM was held at Charlestown Bowling Club on January 26th, 2016. The meeting is summarised on the AGM page. The entrance to the CBC car park is off Ferris Street but MUST be approached from the Club side of Ferris Street. If you approach from the football oval side you have to drive around the block to get to the other side. If you come straight through Charlestown on the highway, turn at the lights at the end of the football oval onto Lincoln Street and bear right onto Ferris towards Charlestown Square. If approaching from the back of Charlestown Square, which is Canberra St but turns into Patricia Avenue at the back of the Bowling Club, turn off Patricia onto Lincoln at the roundabout, go past the CBC main entrance and turn left onto Ferris towards Charlestown Square. The parking lot entrance is about 30m from the turn. We meet every Tuesday evening at The Persian Rose Restaurant 13/1380-1388 Pacific Hwy, Turramurra NSW 2074. 6pm for a 6:30pm start. Anyone who knows they'll be there but are running slightly late can send me a text (+61 415 987 388) to be entered into the draw. We run groups of 4 and/or 3 round robins of 5 point matches. Winners go through to a KO. Club membership is $30 p.a. and evening entry of $5. There is a weekly Jackpot of $10 which is won by a player drawn at the beginning of the evening winning the KO. The balance of the entry is paid out 66/33% winner, RU of the KO. Jackpot not won by year's end will be added to the club championship purse which will pay on a 50%, 25%, 15%, 10% basis to the winner, RU, 3rd and 4th. All money is returned as trophies and prizes. The Presentation Night was held on Friday, December 4th, 2015 at Alder Park Bowling Club. Photos of the night via this link . The Persian Rose Christmas Tournament on Sunday, November 29, 2015 was won by Newcastle's Greg Mitchell. Congratulations Greg! The 2015 Newcastle Open Backgammon Tournament was played on Sunday, September 20th at Club Kotara , Howell St, Kotara. Full details are on the Open Details page. All players are reminded that being available by 7:15, so the draw can be organised, is appreciated. Those who know they will be late should contact BRUCE PARR on 0410892496. It is also asked that players move on in a timely manner from match to match, without any undue delay. The club held it's 2016 AGM on January 26th followed by a Round robin tournament. The results of the AGM are on this page . For many years the club has issued a newsletter called The Blotter on an "as needed" basis. With the advent of the website, a natural progression for issuing information is the development of this page. All the latest information regarding club activities, including finals, tournaments, visits etc will be posted here on a fortnightly basis. Club members are welcome to submit items of interest (both related and non-related to Backgammon) so as there is always something new to view! Other club Tournament organizers may also submit information which may be of interest to our members.